[Concluded] [Giveaway/Contest] 10 x ZoneAlarm PRO Firewall Licenses of 1-year 5-PCs each. Discussion in 'Giveaways and Contests' started by whizkidraj, Feb 24, 2018. 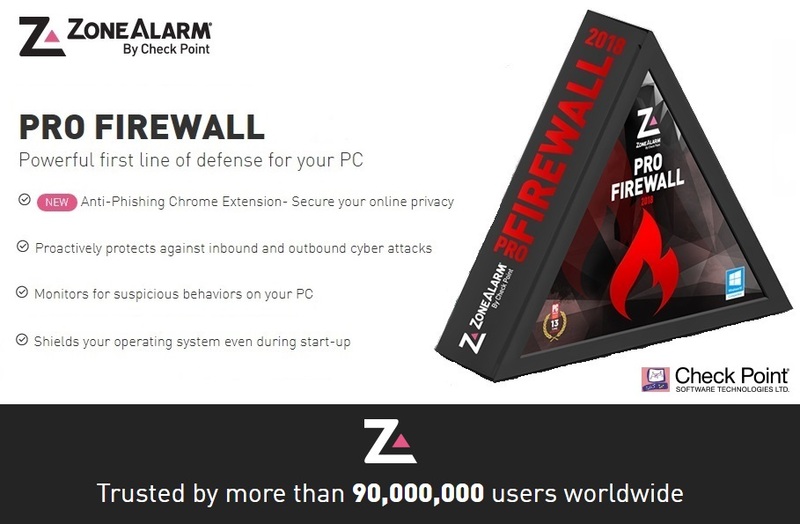 ZoneAlarm's award-winning Pro Firewall gives you the industry's most powerful firewall protection, stopping internet attacks at the front door and catching thieves on their way out. It proactively blocks both inbound and outbound attacks, so your PC is fully protected. The firewall includes Full Stealth Mode, which makes your PC invisible to hackers, as well as Kill Controls, which instantly disable malicious attacks. It also features a quiet, automatic outbound firewall and OSFirewall to block deep-system attacks by monitoring programs for suspicious behavior. It is ideal for professional use and allows you to create expert firewall rules for maximum efficiency. ZoneAlarm Pro Firewall operates automatically so you'll never be interrupted with unnecessary alerts. 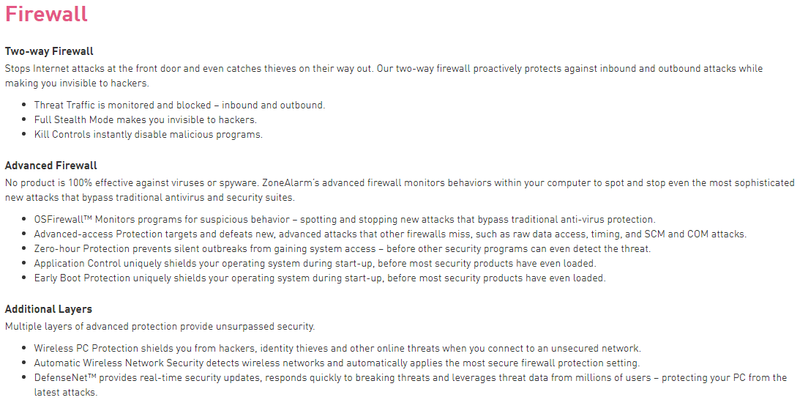 ZoneAlarm Pro Firewall also comes with free Online Backup, Identity Protection, and Gamer Mode. ZoneAlarm Social Links:- Facebook, Twitter, YouTube, Community. I would like to thank my dear friend Mr. Dror Levy, and everyone at ZoneAlarm for sponsoring this awesome giveaway for our forum members. Again, "10 x ZoneAlarm PRO Firewall Licenses of 1-year 5-PCs each" for the giveaway. Lastly, post anything about ZoneAlarm PRO Firewall (usage scenario, your experience) to show your appreciation and love for it. ZoneAlarm PRO Firewall provides advanced functions of the firewall, proactively blocks incoming and outgoing network attacks. Advanced network monitor technology stops viruses and spyware that miss other antivirus programs. Automatic protection of wireless networks detects wireless networks and automatically applies the most secure firewall settings. Additional features include protection against phishing and fraudulent sites using the Google Chrome browser extension and online backup of important data. a great firewall has excellent technologies to stop various viruses and unwanted programs that steal our data. has an automatic Internet network protection. it protects us from phishing and fake websites. program worth recommendation and our attention. thanks for the competition for this amazing firewall and the opportunity to win it. Thank you for the great zonealarm security firewall developed on Israel, i like that product since i have knowledge, a long time ago im using it. Thanks for the give away- Zonealarm have been a good firewall, so count me in the contest. I certainly would be interested in winning! I've not used ZoneAlarm for quite some years now, but back in the day - it was my 1 stop shop for protecting my computers. After an issue I had with an update many years ago, I switched to Kaspersky but I've been keeping my eye on ZoneAlarm for some time and would love the chance to use it again with all it's advanced features unlocked. ZoneAlarm has been a trusted and respected firewall for many years now with a well deserved reputation. Please count me in and good luck to all! I have used it some time back, and found it to be an efficient firewall. The inclusion of chrome extension to tackle phishing attempts sounds good too. It would be great to move back to it. I have used this years before. That time it was good. I do not know what have changed past years. Can give it a try if i win the contest. Will use at home pc. Count me in. 1)Anti-Phishing Chrome Extension- Secure your online privacy 2)Shields your operating system even during start-up 3) Wireless PC Protection shields you from hackers, identity thieves and other online threats when you connect to an unsecured network. Thanks for amazing giveaways as always. Why ZoneAlarm??? Because it agrees very well with my Server 2019 and has no better than it. I used it long time ago and almost forgot about it. I really liked the feature OSFirewall and how it blocked apps from going online. Best one I've found to do this! I would really like to get the new version! Many thanks @whizkidraj for this rare and really exclusive giveaway. I always wanted to try this software as it uses Kaspersky technology and we all know that Kaspersky is one of the best security solution on the market. This firewall got my attention especially for the 2 way firewall feature as Agnitum had once. Amongst other features i also like the HIPS capabilities they offer so i would like to win a license for this software. Best of luck @ all. Sheer coincidence - I have begun to use the Free version of this exquisite software. Last week the number of BSODs was perplexing so I switched privatefirewall for ZoneAlarm Free and my life has been a smooth sailing ever since. Bravo for the top-notch software! Great thanks for the giveaway. I really need a very good firewall as my AV has not firewall protection. This software looks very good and has many good reviews on the internet so i would like to be counted in this giveaway. Thanks for giveaway. It's a great firewall software. ZoneAlarm PRO Firewall will provide its amplification. ZoneAlarm PRO Firewall combines all the features of the company's free firewall with advanced security features, premium technical support and innovative anti-phishing protection and features two-way firewall, personal data protection, advanced firewall and online backup.